Receptionists’ uniforms are particularly important since they are usually the first point of contact for patients and clients. First impressions count. Therefore receptionist workwear has to reflect positively on the organisation and be in keeping with its uniform guidelines. Receptionists are expected to look professional but there is also no reason why you can’t be stylish too! And if you buy from us there is no minimum order. We have a wide range of feminine Female Tunics in plain solid colours and stripes including a Beauty Tunic with a 2 piece wrap over front. We know many of you prefer this style and ours is available in Black in sizes 8 to 28. As well as the wrap front ours has a stand collar, 2 lower front hip pockets and back vents and pleats. It’s available in a regular fit and has a 79cm finished length. Your name or a logo can be embroidered on the front. Alternative colours are available from our Bespoke Design Service. Our other female tunics include the Female Tunic – White and Female Tunic – Sky. Other solid colours we always have in stock include Bottle, Hospital and Sailor Navy. All are finished off with contrast piping and are again available in sizes 8 to 28. 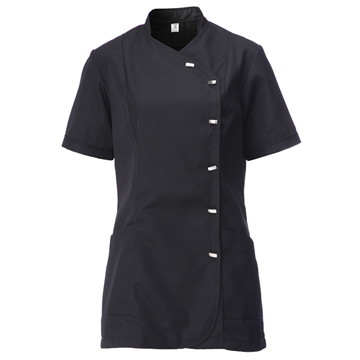 These tunics have 4 pockets including a waterproof pen pocket. We also offer Saver Pack of 10 Female Tunics – White. Mixed size packs are available at no extra cost. We also have 5 striped Female Tunics including Female Tunic (Stripe) Aqua, Female Tunic (Stripe) Blue and Female Tunic (Stripe) Grey. These share the same stylish features as our plain tunics including concealed zip front fastening and shaped cuff ends and of course a name or logo can be added. For men, we have a number of tunics including our Male Tunic – White. 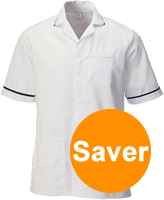 It’s also available in a Saver Pack of 10 Male Tunics – White. It has an 80cm finished length and is available in sizes 36 to 54. To complement our tunics we design 7 styles of trouser. Options for women include ourFemale Bootleg Trouser – Navy available in sizes 8 to 26 and in a Regular or Tall fitting. Men have a choice of 2 styles of trouser in Navy or Black including Mens Trouser Two – Navy. These trousers come in sizes 30 to 42 and in 2 lengths so you can find the perfect fit.